One of the biggest obstacles in the wide-spread industrial take-up of Grid technology is the existence of a large amount of legacy code programs that is not accessible as Grid Services. On top of that, Grid technology challenges the user in order to intuitively interconnect and utilize resources in a friendly environment. 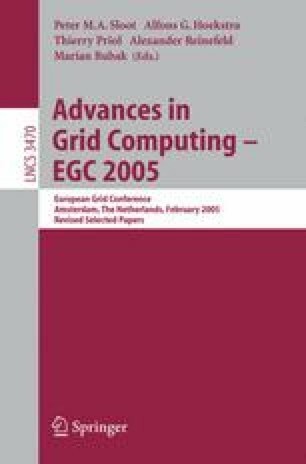 This paper describes how legacy code applications were transformed into Grid Services using GEMLCA providing a user-friendly high-level Grid environment for deployment, and running them through the P-GRADE Grid portal. GEMLCA enables the use of legacy code programs as Grid services without modifying the original code. Using the P-GRADE Grid portal with GEMLCA it is possible to deploy legacy code applications as Grid services and use them in the creation and execution of complex workflows. This environment is tested by deploying and executing several legacy code applications on different sites of the UK e-Science OGSA testbed. The work presented in this paper was initially supported by EPSRC funded project (Grant No: GR/S77509/01): A proposal to evaluate OGSA/GT3 on a UK multisided testbed. The integration of GEMLCA, P+Grade and other Grid tools and projects is currently supported by “CoreGrid”, network of excellence in “Foundations, Software Infrastructures and Applications for large scale distributed, Grid and Peer-to-Peer Technologies”.